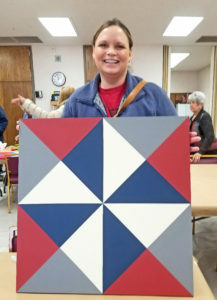 We had a real barnburner in the Hansen Museum Community Room on Saturday, March 16th as instructor Jessie Wyrill, Kirwin, KS, led fifteen participants through the process of painting their own barn quilt. It was a quick-paced four hours, yet relaxing and incredibly satisfying as the process unfolded. Due to the popularity of the class, we hope to schedule another barn quilt painting class in early summer. Watch our Facebook page for details. Allen and Patty Eckman – artists of our current exhibit, Cast Paper Sculptures are fascinated with the American West. They appear to be drawn to capturing good “ole- fashioned” hard work and honest living. 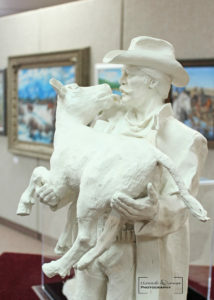 Allen’s sculpture Saved from the Flood is a wonderful example of this idea as it depicts a cowboy in full regalia carrying a calf to safety with the calf licking his face gratefully. A particularly pertinent piece today as we think of our Nebraskan neighbors. Our hearts and thoughts go out to them as they struggle to save their homes and livelihoods. The Eckman’s art will be on view at the Dane G. Hansen Museum through June 2, 2019. Please make plans to come see this remarkable exhibition. Carol Bales has once again remodeled the Crystal Tower. This new configuration includes some original very rare Dorothy Thorpe glassware. In the 40’s and 50’s Ms. Thorpe would purchase blank glassware, decorate it, and then sell. Originally known for her floral designs, late in her designing career Thorpe moved to a crisp modern look which implemented wide platinum or silver bands on her glassware. Carol has displayed a lovely mid-century set of six Thorpe glasses in an elegant silver carousel and a superb vintage punch bowl with twelve gorgeous glasses in the Tower this season. 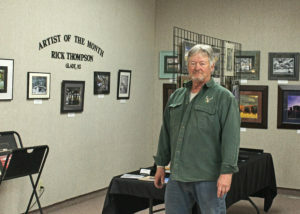 March’s Artist of the Month is Rick Thompson a nature photographer from Glade, Kansas. Rick chose photography as his medium almost by default. An avid outdoorsman, Rick wanted to capture the beauty he saw outdoors, but was unable to do so satisfactorily by drawing or painting. Having always admired the work of Ansel Adams in Life Magazine and National Geographic, he decided to explore photography. Rick is mostly self-taught, but did take a few outreach courses with Kansas artist-in-residence Gary Marsh through Colby Community College. The Dane G. Hansen Museum invites you to come explore the outdoors through Rick’s eyes during the month of March. Eckman Fine Art – Cast Paper Sculptures by Allen and Patty Eckman will be on display through June 2, 2019. Please make plans to visit this remarkable exhibition.